The bold and earthy colours in this collection are used to create modern designs suitable for any contemporary home. The thick luxurious pile is stain resistant and anti-shed, even in high traffic areas and although we call it a cheap rug, its quality is impeccable. To really make your Nordic Shaggy rug stand out, try pairing it with items in your chosen room such as lamps, paintings and cushions to get the most out of the bold blues, oranges and reds that is available in this collection. 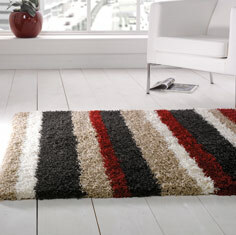 Nordic rugs are made in 6 popular rug sizes which include a runner and extra large 200x290cm size.